Call Us: (973) 256-3000 Plast-O-Matic Valves, Inc.
Quick closing valves, positive displacement pumps, and vertical pipe runs can create damaging pressure spikes, leading to blown diaphragms, seals and gaskets also destroyed meters and gauges. Liquid for all practical purposes is not compressible, any energy that is applied to it is instantly transmitted. This energy becomes dynamic in nature when a force such as quick closing valve or a pump applies velocity to the fluid. Surge or water hammer, as it is commonly known is the result of a sudden change in liquid velocity. Water hammer usually occurs when a transfer system is quickly started, stopped or is forced to make a rapid change in direction. Any of these events can lead to catastrophic system component failure.Without question, the primary cause of water hammer in process applications is the quick closing valve, whether manual or automatic. A valve closing in 1.5 sec. or less depending upon valve size and system conditions, causes an abrupt stoppage of flow. The pressure spike(acoustic wave)created at rapid valve closure can be high as five (5) times the system working pressure. Unrestricted, this pressure spike or wave will rapidly accelerate to the speed of sound in liquid, which can exceed 4000 ft/sec. It is possible to estimate the pressure increase by the following formula. Pulsation generally occurs when a liquid’s motive force is generated by reciprocating or peristaltic positive displacement pumps. It is most commonly caused by the acceleration and deceleration of the pumped fluid. This uncontrolled energy appears as pressure spikes. Vibration is the visible example of pulsation and is the culprit that usually leads the way to component failure. Unlike centrifugal pumps(which produce normally non-damaging high-frequency but low-amplitude pulses), the amplitude is the problem because it’s the pressure spike. The peak, instantaneous pressure required to accelerate the liquid in the pipe line can be greater than ten (10) times the steady state flow pressure produced by a centrifugal pump. Damage to seals gauges, diaphragms, valves and joints in piping result from the pressure spikes created by the pulsating flow. Suggest that you install a pulsation dampener. Dampeners provide the most cost efficient and effective choice to prevent the damaging effects of pulsation. A surge suppressor is in design essentially the same as pulsation dampener. The difference primarily lies in sizing and pressurizing. The most current pulsation dampener design is the hydro-pneumatic dampener, consisting of a pressure vessel containing a compressed gas, generally air or Nitrogen separated from the process liquid by a bladder or diaphragm. The dampener is installed as close as possible to the pump or quick closing valve and is charged to 85% of the liquid line pressure. Proper sizing of the pulsation or surge suppressor requires several calculations. A close contact with the suppressor’s manufacturer will ensure the correct sizing for a particular application. By knowing how to avoid situations that will create water hammer or pulsations during the specification process, or while trouble shooting, you can eliminate a lot of problems, failed valves and equipment, and costly downtime. 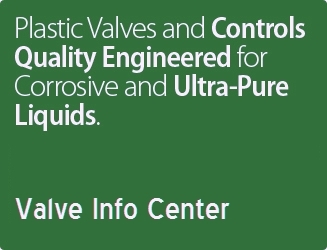 Yahya Bengali & Rick Bolger, Plast-O-Matic Valves, Inc.
For additional information, please return to the Plast-O-Matic Tech Info Center.